The Chief of Army Staff, Tukur Buratai, said on Thursday in Abeokuta that violent herdsmen ravaging some parts of the country may have links with the Boko Haram. 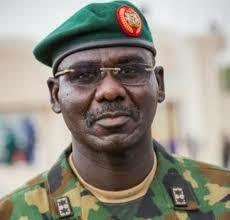 Mr. Buratai, who spoke during a courtesy call on Gov. Ibikunle Amosun of Ogun, said the Nigerian Army was investigating the activities of the violent herdsmen. Mr. Buratai identified timely information on the nefarious activities of the herdsmen as one of the best ways to tackle them, saying Nigerians must be security conscious at all times. “We want to call on all Nigerians to be security conscious and to report any suspicious persons or group of people that are roaming about in their communities. “One may not be too far from the fact that some of these herdsmen that are attacking communities across the country may have some affiliation with the Boko Haram terrorists. “This we are further investigating and also pursuing them so that we can address the situation, so let’s be security conscious. Let’s report quickly movement of suspicious persons carrying arms. “If you suspect any individual within your community, we should be able to report immediately. “Timely information is very important. We have our troops deployed in certain areas and I believe the Police are working with them to be able to tackle any challenge that comes, “he said.